‘ALL HEAL’ is how the medicinal world calls Valerian herb and more than 250 species of this plant variety. This name was derived from the Latin word ‘Valere’ meaning ‘to feel good‘ or ‘to be well’. Yes! You might have now known why this therapeutic herb is celebrated all through these years in treating a wide range of illnesses since the 2nd century A.D. In this context we are going to travel around the enormous health benefits of the species Valeriana Wallichii also known as Indian Valerian and is indigenous to India and is cultivated all around the world. The most popular one among this family Valerianaceae is Valeriana Officinalis, which is native to Europe and North America but Valeriana Wallichii is used as an effective alternative to V. Officinalis with more or less the same healing values. This herb is commonly known as Tagara in the Ayurvedic world of medicines. 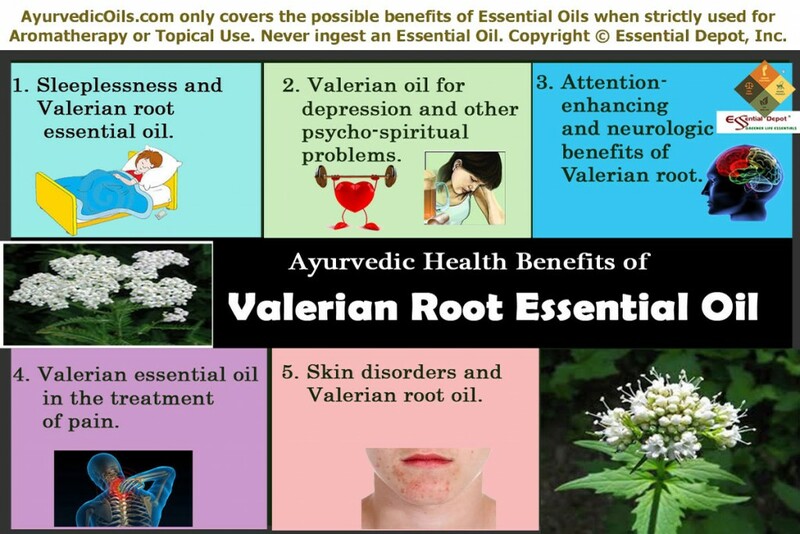 Ayurvedic texts suggest the use of Valerian root and the essential oil extracted from this root to treat an extensive range of illnesses including insomnia, skin problems and certain other nervous disorders. Valerian is listed as ‘Generally Recognized As Safe” by the United States Food and Drug Administration and has been approved as an effectual mild sedative by German’s Commission E.
Aelius Galenus, the popular Roman physician, philosopher and surgeon prescribed Valerian root for treating insomnia. Valerian tea was prescribed to treat a sick woman by Pilgram Marpeck, the Anabaptist reformer in the sixteenth century. Dioscorides, the renowned Greek physician recommended this herb for the treatment of digestive disorders, urinary tract infections, heart palpitations, epilepsy and few other skin problems. Hippocrates, the father of western medicine also suggested Valerian root as an effective anti-depressant and as a remedy for treating insomnia. During the medieval times in Sweden, this herb was said to be placed in the wedding clothes of the bridegroom to keep away from the envy of the elves. Such a historical mark of this herb spread its use extensively as an efficacious sedative for nervous disorders, menstrual cramps, anxiety, behavioral problems in childhood, high blood pressure, irritable bowel syndrome, learning difficulties and few other health conditions. Valerian was also used in baths to alleviate pain and promote sleep for fibromyalgia patients. Valerian Wallichii is the popular species used in the Indian Ayurvedic system of healing mankind and is known as the major species of Valeriana genus. Valeriana Wallichii is used as a significant substitute for the European species Valeriana Officinalis and has been an important part of the traditional healing system for treating skin disorders, obesity, snake poisoning, sleep disorders and nervous problems. Charaka, the Ayurvedic philosopher has named Tagara as Sitaprasamana meaning to relieve cold feeling of the skin. This herb is also known as Sirsa dosaghna, meaning treats the illnesses of the head; Chaksusya meaning effective for the eyes; Bhutapasmara nasan meaning a promising remedy for hysteria, epilepsy and certain other evil powers; Visaghna meaning a natural anti- toxin. According to Ayurveda, human body is made up of three predominant doshas or individual body types namely vata, pitta and kapha where vata governs metabolism and is in charge of destructions and eliminations of the body, pitta controls reasoning capacity, digestion and body temperature and kapha is responsible for the shape and structure of your body and is accountable for the power to repair the imbalances of the body. According to Ayurveda, valeriana wallichii is an effective herb in treating vata, pitta and kapha imbalances. Valerian root essential oil is known for its deep, rich, musky and woody aroma. The essential oil of Valerian root is said to have sedative, stimulant, anti-epileptic, stomachic, antispasmodic, analgesic, carminative, analeptic and nervine properties. The major constituents of Valerian root essential oil are limonene, borneol, pienene, sesquiterpenes, nerolidol, p-cymene, valerone, malliol, valerenic acid and 1, 8-cineole. The sedative property of this oil makes it a promising remedy for treating insomnia. Valerian is a well-known alternative to prescription drugs for sleeping disorders mainly because of its safe and gentle effects on the human body. Numerous studies have proved that Valerian aids people to fall asleep quicker and is also found that they have a quality sleep without any disturbances mentally. Researchers also ensure that not like many over-the-counter sleeping pills, valerian have lesser side effects. Valerian root essential oil can be used by burning it in an aroma lamp before going to bed or used as soothing massage oil with tranquilizing carrier oils like coconut oil or by adding few drops to your bathing water in the evening. Renowned scientists trust that Valerian augments the amount of GABA in the brain where GABA is a chemical by name gamma aminobutyric acid. This chemical aids in promoting a calming effect on anxiety and control the nerve cells. The distinct aroma of this oil is trusted to combat seizures, anxiety, neuralgia, emotional stress, mental strain, depression, restlessness, tension and trauma. Recent studies have proved the effectiveness of Valerian Wallichii essential oil as an effective anti-depressant and this ability to dispirit the central nervous system aids you in attaining deep hypnotic states. Tagara assists in discharging toxins from the nerves, joints, blood, colon and tissues and acts directly on the nerve channels. It is a well-known fact that numerous herbalists and physicians use preparations containing Valerian essential oil in the treatment of many psychosomatic problems, peripheral, central and autonomic nervous system conditions. The attention-enhancing property of this herb has made some German physicians to use Valerian root to treat ADHD, attention deficit hyperactivity disorder in children. According to the PMDD information blog that talks about preventing and treating severe premenstrual syndrome, valerian root is an effective natural remedy for treating PMDD problems and dysmennorhea. It is also said that the anxiety and sleeping difficulties due to premenstrual concerns can be easily treated by using this herb. Valerian root essential oil also aids in treating migraine pains, gout pains, rheumatism and headaches due to cold. With its antispasmodic properties, this oil is also used widely in the healing of muscular spasms. Charaka Samhita says that the best way to keep away from pain and get a peaceful sleep is to take a warm, relaxing bath before bed. Adding 2 to 3 drops of Valerian oil to your bath tub can help you fight against most of your painful conditions effectively. Few drops of Valerian essential oil added to your skin cream can help in treating dry scaly skin. The antibacterial properties of this oil is helpful in the remedy of burns, cuts, wounds, open sores, eczema, bruises, psoriasis, itchiness, boils, acne, scars, insect bites, stings etc. You can apply this oil externally on the affected area after blending it with your favorite carrier oils or to your skin care cream. The soothing effect of this oil will calm and cool your skin instantly. Valerian root essential oil is a valuable remedy for treating vata disorders like facial palsy, flatulence, and paralysis. This oil is also effective in lessening kapha imbalances and is used as a natural remedy for treating asthma, whooping cough and certain other respiratory infections. The carminative and bitter properties of this oil assist in stimulating the appetite and treat indigestion and few other digestive problems like constipation, diarrhea and digestive ulcers. Except for its pungent odor, nothing else can stop you from using Valerian root essential oil to enjoy its greater natural health benefits. 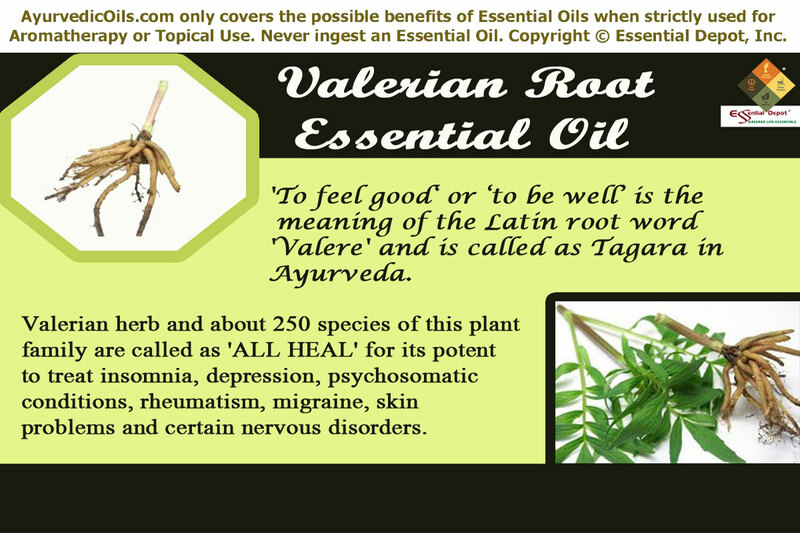 Disclaimer: Do not ingest Valerian root essential oil unless suggested by your Certified Ayurvedic Practitioner. This entry was posted in Ayurvedic Essential Oils, Essential Oils - Learn About and Purchase and tagged Ayurvedic health benefits of Valerian root oil, Ayurvedic oils for depression, Ayurvedic oils for insomnia, Chemical constituents of Valerian root oil, Essential oils for pain, Essential oils for PMS, essential oils for skin care, Health benefits of Valerian root essential oil, Natural oils for insomnia, Oils for ADHD, Tagara, Therapeutic properties of Valerian root oil, Valerian oil and Ayurveda, Valeriana Officinalis, Valeriana Wallichii by AyurvedicOils. Bookmark the permalink.